Since the terrifc mid-season finale came and went, here’s what I think about CW’s Fastest Man Alive series. Producer Greg Berlanti with Geoff Johns onboard executive producing are doing a much better job here then their Dork Knight ripoff (Arrow). It’s so good to see a light-hearted superhero show again after somber oversaturations. Once again Grant Gustin has charisma as Barry Allen aka Scarlet Speedster to carry it. First couple of episodes had him going Sherlock Scan on some crime scenes which have been abandoned since then. Jesse L. Martin (Rent) playing Detective Joe West (instead of Ira West) brings very genuine emotion regarding Barry maintaining moral guidance. Tom Cavanagh (Scrubs) is amongst best actors with “Dr. 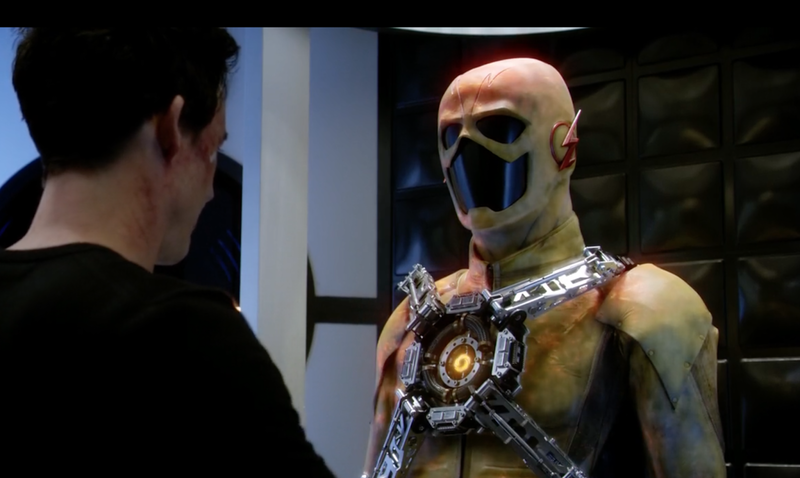 Harrison Wells” which episode nine (“Man in the Yellow Suit”) proved since “Pilot”, he’s an alternate Eobard Thawne/Professor Zoom aka Reverse Flash (hence taction chestplate) from the twenty-fifth century. His motivation however refers-to Hunter Zolomon (Wally West’s adversary) by pushing his nemesis’ super-speed to it’s max. Almost everything he says has double-meaning that somehow nobody suspects (Joe at first in episode six, “The Flash is Born”). Still don’t see how Gorilla Grodd factors into his master-plan since Star Lab’s expermental simian has ape-conquest on his mind. Opposite speedster running-around was Pre-Crisis Eobard. Having young Barry go back to stop his mother’s murder might work better then his future-self doing something that selfish which irritated me most about Flashpoint (comic and film). John Wesley Shipp (Henry Allen) brings a passing-the-torch (like Christopher Reeve and Tom Welling) while at the same time carries heart everytime he shares scenes with Gustin. Hope Amanda Pays reprising Tina McGee reoccurs after she called Barry out for pulling some blackmail tactics. Goes-to-show Eobard’s influence over him especially since he almost found out who he trully was by his indifference to Tony Woodward/Girder (another Wally enemy)/Colossus knock-off’s abrupted demise. Really looking forward to Mark Hamill’s third (voiced in JLU’s “Flash and Substance”) Jesse James/Trickster outing. Rick Cosnett’s “Eddie” Thawne could be Malcolm Thawne/Cobalt Blue (Barry’s lost brother) since he’s Eobard’s distant ancestor. Abstracting blood from Blackout (episode seven, “Power Outage”) might be used on “Eddie” when eventually turns (he’s off). She calls Barry’s beliefs “a sad nerdy dream” meaning “you’re pathetic”. Eyeballing “Pretty-Boy”/”Guy I’m totally going to hook-up with”. Shallow much? TPTB constantly having her kiss “Eddie” in-front-of Barry just to rub-salt-in-the-wound. Having hots for Stephen Amell’s Oliver Queen in crossover “event”. First part being an excuse for two-heroes-to-fight-each-other is beyond overdrawn. Suffers from Silver Age Lois Lane Syndrome despite Barry’s voice sounding like a broken bullhorn. Things must change soon to end this pointless shipper (I don’t care) subsequently her expression meant “Finally” when Barry confessed his love for her. Just marking time for Caltin Snow (cause she’s Ice) becoming Killer Frost despite Danielle Panabaker’s decent performance. Leonard Snart/Captain Cold (Wentwood Miller) returns with Mick Rory/Heatwave (Prison Break co-star, Dominic Purcell).